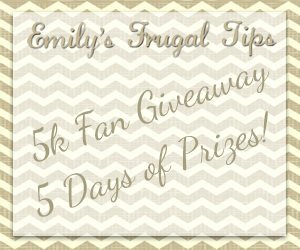 Emily’s Frugal Tips, Freetail Therapy , Tracer”s Coupon Affair, Dr WannaCatchaLot and Extreme Hispanic Couponing welcomes you to 5K Fan Celebration! Emily, owner of Emily’s Frugal Tips is a new blogger in the blogging community and has worked extremelly hard to reach 5,000 fans in the 1 year that she’s been blogging. Finally, all that hard work has paid off and here we are celebrating an awesome success with an AWESOME giveaway!!! 1 lucky fan will win a $5 Amazon Gift Card & (3) $10-restaurant.com egiftcards everyday for 5 days! That’s 5 chances to win! Rules & Disclaimer: You need to be 18 years of age or older and a US resident to enter. No fraudulent entries will be accepted and if it’s found that you’ve fraudently entered you will be barred from entering Emily’s Frugal Tips giveaways permently. All entries will be varified and any incomplete entries will be deleted. Emily’s Frugal Tips, Tracer’s Coupon Affair, Freetail Therapy, Dr. Wannacatchalot, and Extreme Hispanic couponing are not responsible for lost or stolen prizes once they are sent to the winner. Now for the fun part! To enter the giveaway simply fill out the simple Rafflecopter form below. It’s as simple as that! Flash Giveaway – Potty Covers! What a great achievement, congrats. Thanks for the giveaway. Yeah I’m trying to fix it right now. sorry for the hassle! congrats thank you for giveaway . Congrats on reaching 5,000 fans!! WTG !! And thank you for all your time and effort to put together this celebration giveaway! Good Luck to Everyone!